Mandy has created this new Easter coloring page for 2012. It shows four children holding hands with key elements of the Gospel story written on their t-shirts. Overhead, there is a cross among clouds. He came to Earth – He lived a perfect life – He died on the cross – He is risen! Directions: Click on the preview image to the right to download a print-friendly PDF version of this coloring sheet. We’ve also uploaded a higher resolution PNG image for advanced users to edit how they like. Be sure to browse all our free ministry resources for Easter. 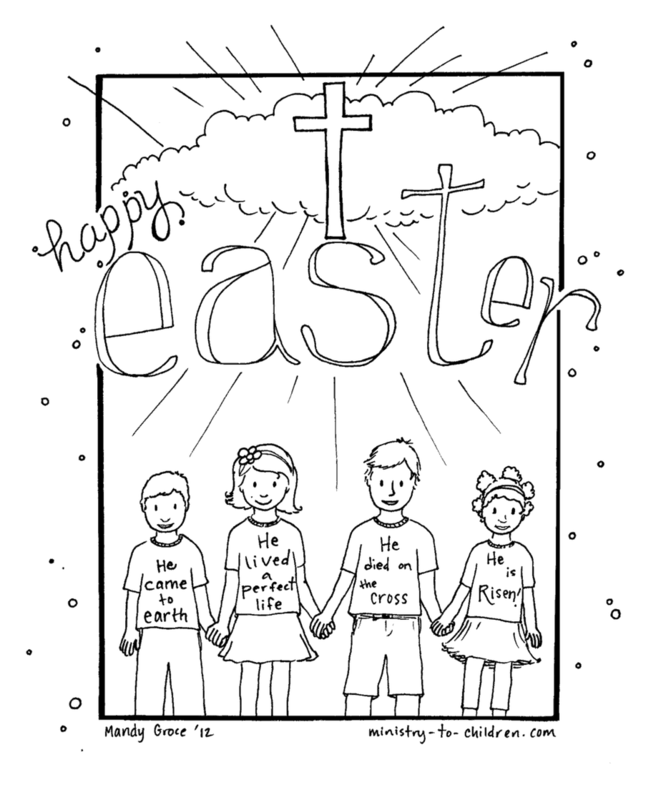 We have several other Easter coloring pages created by Mandy from previous years. 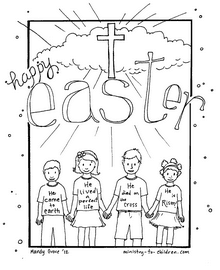 This printable can be used at home or school leading up to Easter. It could also form the basis of a family devotional about the Resurrection for younger children. Leave a comment below to share your own creative ideas with other readers. Tony Kummer (Editor) reviewed & updated this page on : March 6, 2012 at 9:01 am. All our content is peer reviewed by our readers, simply leave a comment on any post suggest an update.